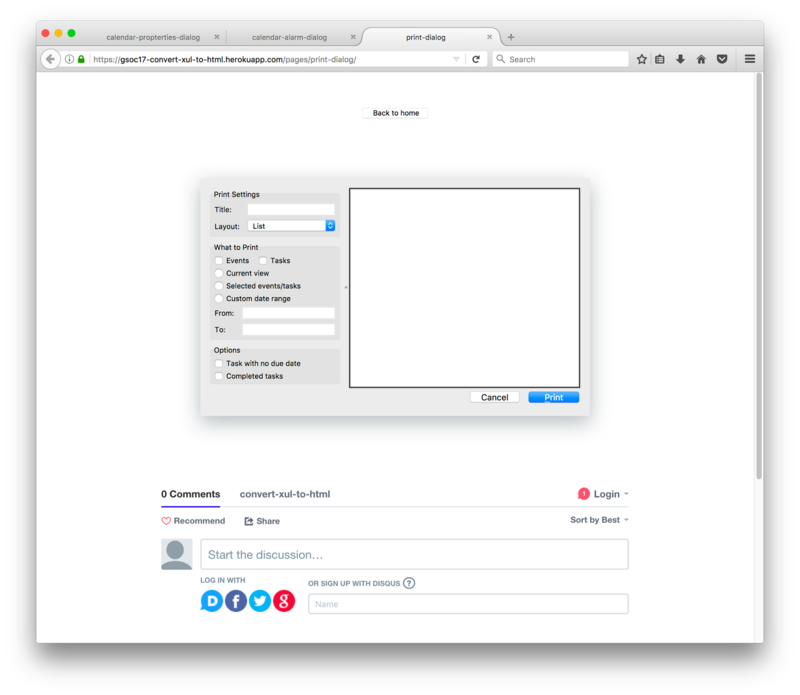 In the past blog, I talked mostly about the development environment setup, but this blog will be about the react dialog development. Since then I have been working on converting some more dialogs into React. I have converted three dialogs — calendar properties dialog, calendar alarm dialog and print dialog into their React equivalent till now. Calendar alarm dialog and print dialog still need some work on state logic but it is not something that will take much time. Here are some screenshots of these dialogs. While making react equivalents, I found out XUL highly depends upon attributes and their values. HTML doesn’t work with attributes and their values in the same way XUL does. HTML allows attribute minimization and with React there are some other difficulties related to attributes. React automatically neglects all non-default HTML attributes so to add those attributes I have to add it explicitly using setAttribute method on the element when it has mounted. Here is a short snippet of code which shows how I am adding custom HTML attributes and updating them in React. XUL also have dialog element which is used instead of window for dialog boxes. I have also made its react equivalent which has nearly all the attributes and functionality that XUL dialog element has. Since XUL has slightly different layout technique to position elements in comparison to HTML, I have dropped some of the layout specific attributes. With the power of modern CSS, it is quite easy to create the layout so instead of controlling layout using attributes I am depending more upon CSS to do these things. Some of the methods like centerWindowOnScreen and moveToAlertPosition are dependent on parent XUL wrapper so I have also dropped them for React equivalent. There are some elements in XUL whose HTML equivalents are not available and for some XUL elements, HTML equivalents don’t have same structure so their appearance considerably differs. One perfect example would be menulist whose HTML equivalent is select. Unlike menulist whose direct child is menupopup which wraps all menuitem, select element directly wraps all the options so the UI of select can’t be made exactly similar to menulist. option elements are also not customizable unlike menuitem and it also doesn’t support much styling. While it is helpful to have React components that behave similar to their XUL counterparts, in the end only HTML will remain. Therefore it is unavoidable that some features not useful for the new components will be dropped. As each platform has its own specific look, there are naturally differences in CSS rules. I have organized the files in a way that it is easy to write rules common to all platforms, but also add per-OS differences. A lot of the UI differences are handled automatically through -moz-appearance rules, which instruct the Mozilla Platform to use OS styling to render the elements. 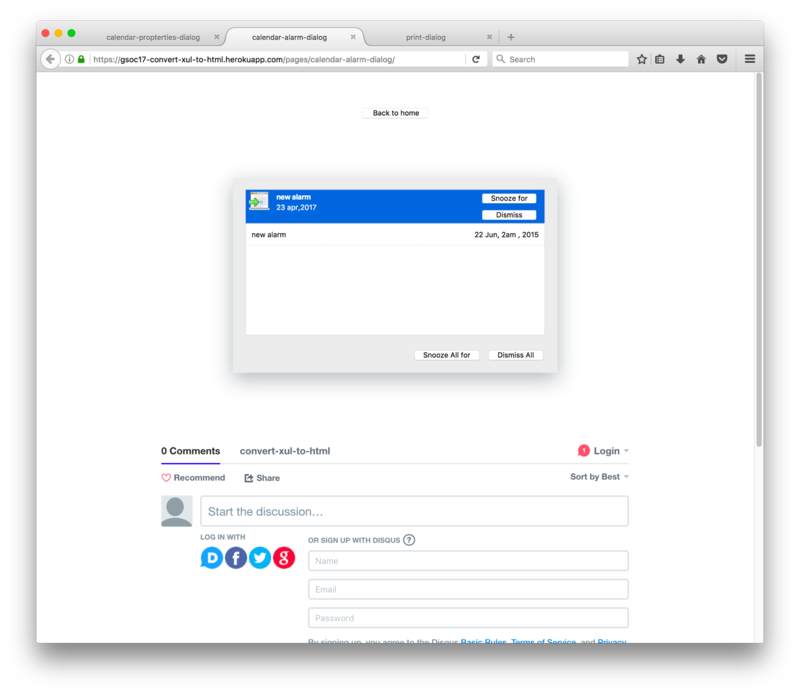 The web app will automatically detect your OS so you can see how the dialog will look on different platforms. I thought it would be great to get quick suggestions and feedback on UI of dialogs from the community so I have added a comment section on each dialog page. I will be adding more cool features to the web app that can possibly help in making progress in this project. Thanks to BrowserStack for providing free OSS plans, now I can quickly check how my dialogs are looking on Windows and Mac. Feel free to check the dialogs on web app and comment if you have any questions. React’s different approach to state does present some challenges for using it with existing code. For this project at least it is not simply a matter of dropping it in and having it work, rather using it will entail some non-trivial code refactoring. Basically, the code will need to be separated out into different jobs. First there’s (1) interacting with the outside of the iframe (e.g. toolbar, menubar, statusbar) and (2) modifying and/or formatting the event or task data. These are needed for both the XUL and HTML UIs. Next there’s (3) updating and interacting with the XUL UI inside the iframe. Currently these things (1, 2, and 3) are usually closely intertwined, for example in a single function. Then there is (4) using React to define components and how they respond to changes to the app state, and (5) updating and interacting with the HTML UI inside the iframe (i.e. read from or write to the app state in the top-level React component). So there is some significant refactoring work to do, but after it is done the code should be more robust and maintainable. The clock has run out on Google Summer of Code 2016. In this post I’ll summarize the feedback we received on the new UI design and the work I’ve been doing since my last post. One commenter advocated for keeping the current date/time picker design, while another just wanted to be sure to keep quick and easy text entry. A question about how attendees availability would be shown (same as it is currently). A request to consider following Google Calendar’s reminders UI. A question about preserving the vertical scroll position across different tabs (this should not be a problem). Thanks to everyone who took the time to share their thoughts. It is helpful to hear different views and get user input. If you have not weighed in yet, feel free to do so, as more feedback is always welcome. See the previous blog post for more details. Getting this working in a really polished way took more time than I anticipated, largely because the code had to be refactored so that the majority of the UI lives inside an iframe. This entailed using asynchronous message passing for communication between the iframe’s contents and its outer parent context (e.g. toolbars, menus, statusbar, etc. 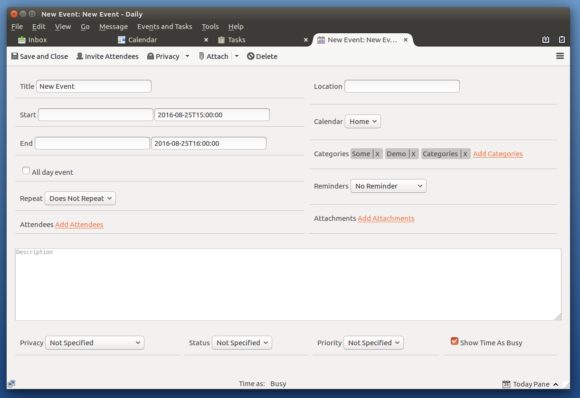 ), whether that context is a tab or a dialog window. While this is not a visible change, it was necessary to prepare the way for the new HTML-based design, where an HTML file will be loaded in the iframe instead of a XUL file. 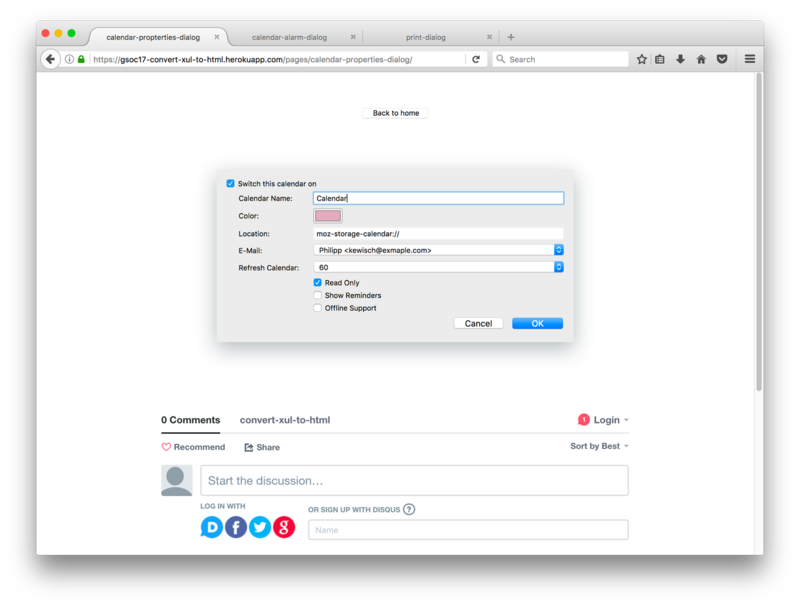 In the next two posts I’ll describe how to try out this new feature in a development version of Thunderbird, discuss the HTML implementation of the new UI design, and share some thoughts on using React for the HTML implementation. Today is the first day of the “coding period” for Google Summer of Code 2016 and I’m excited to be working on the “Event in a Tab” project for Mozilla Calendar. The past month of the “community bonding period” has flown by as I made various preparations for the summer ahead. This post covers what I’ve been up to and my experience so far. After the exciting news of my acceptance for GSoC I knew it was time to retire my venerable 2008 Apple laptop which had gotten somewhat slow and “long in the tooth.” Soon, with a newly refurbished 2014 laptop via Ebay in hand, I made the switch to GNU/Linux, dual-booting the latest Ubuntu 16.04. Having contributed to LilyPond before it felt familiar to fire up a terminal, follow the instructions for setting up my development environment, and build Thunderbird/Lightning. (I was even able to make a few improvements to the documentation – removed some obsolete info, fixed a typo, etc.) One difference from what I’m used to is using mercurial instead of git, although the two seem fairly similar. When I was preparing my application for GSoC my build succeeded but I only got a blank white window when opening Thunderbird. This time, thanks to some guidance from my mentor Philipp about selecting the revision to build, everything worked without any problems. One of the highlights of the bonding period was meeting my mentors Philipp Kewisch (primary mentor) and MakeMyDay (secondary mentor). We had a video chat meeting to discuss the project and get me up to speed. They have been really supportive and helpful and I feel confident about the months ahead knowing that they “have my back.” That same day I also listened in on the Thunderbird meeting with Simon Phipps answering questions about his report on potential future legal homes for Thunderbird, which was an interesting discussion. At this point I am feeling pretty well integrated into the Mozilla infrastructure after setting up a number of accounts – for Bugzilla, MDN, the Mozilla wiki, an LDAP account for making blog posts and later for commit access, etc. I got my feet wet with IRC (nick: pmorris), introduced myself on the Calendar dev team’s mailing list, and created a tracker bug and a wiki page for the project. Following the Mozilla way of working in the open, the wiki page provides a public place to document the high-level details related to design, implementation, and the overall project plan. If you want to learn more about this “Event in a Tab” project, check out the wiki page. It contains the mockup design that I made when applying for GSoC and my notes on the thinking behind it. I shared these with Richard Marti who is the resident expert on UI/UX for Thunderbird/Calendar and he gave me some good feedback and suggestions. I made a number of additional mockups for another round of feedback as we iterate towards the final design. One thing I have learned is that this kind of UI/UX design work is harder than it looks! I think that about covers it for now. I’m excited for the coding period to get underway and grateful for the opportunity to work on this project. I’ll be posting updates to this blog under the “gsoc” tag, so you can follow my progress here. It is about time for a new blog post. I know it has been a while and there are certainly some notable events I could have blogged about, but in today’s fast paced world I have preferred quick twitter messages. 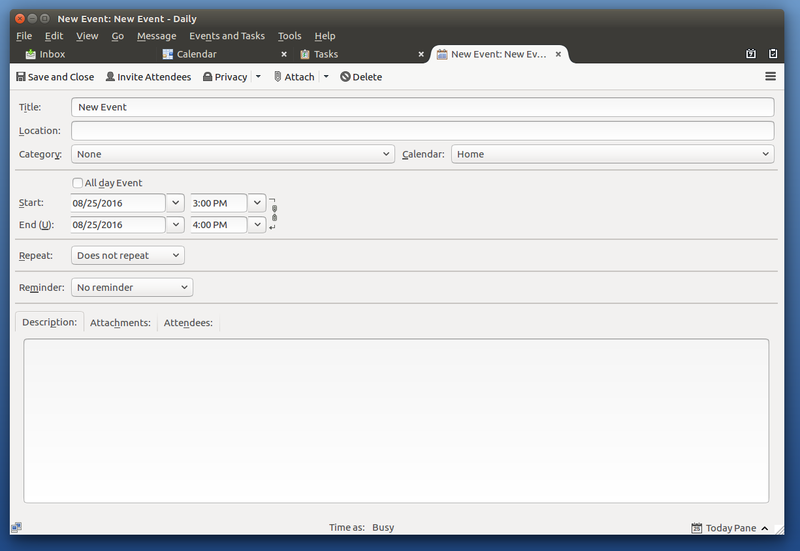 Paul will be working on the Event in a Tab project, which aims to allow opening a calendar event or task in a tab, instead of in the current event dialog. Just imagine the endless possibilities we’d have with so much space! In the end you will be able to view events and tasks both in the traditional dialog and in a tab, depending on your preference and the situation you are in. The project will have two phases, the first taking the current event dialog code and UI as is and making it possible to open it in a tab. The textboxes will inevitably be fairly wide, but I believe this is an important first step and gives users a workable result early on. Once this is done, the second step is to re-implement the dialog using HTML instead of XUL, with a new layout that is made for the extra space we have in a tab. The layout should be adaptable, so that when the window is resized or the event is opened in a narrow dialog, the elements fall in to place, just like you’d experience in a reactive designed website. You can read more about the project on the wiki. Paul has already made some great UI mock-ups in his proposal, we will be going through these with the Thunderbird UI experts to make sure we can provide you with the best experience possible. I am sure we will share some screenshots on the blog once the re-implementation phase comes closer. Paul will be using this blog to give updates about his progress. The coding phase is about to start on May 22nd after which posts will become more frequent. Please join me in welcoming Paul and wishing him all the best for the summer! …but of course there is is a release for Thunderbird 38! Since the release date for Thunderbird has been postponed and in the meanwhile Firefox has released 38.0.1, Thunderbird will also be released as Thunderbird 38.0.1. Since the Lightning version is automatically generated at build time, we have just released Lightning 4.0.0.1. If you are still using Thunderbird 31 and Lightning 3.3.3, you will be getting an update in the next days. The exciting thing about this release is that Lightning has been integrated into Thunderbird. I expect there will be next to no issues during upgrade this time, because Thunderbird includes the Lightning addon already. If you can’t wait, you can get Thunderbird in your language directly from mozilla.org. If you do happen to have issues with upgrading, you can also get Lightning from addons.mozilla.org. The latest Seamonkey version is 2.33.1 at the time of writing, you need to use Lightning 3.8b2 in this case. For more information on compatibility, check out the calendar versions page. As mentioned in a previous blog post, most fixed issues are backend fixes that won’t be very visible. 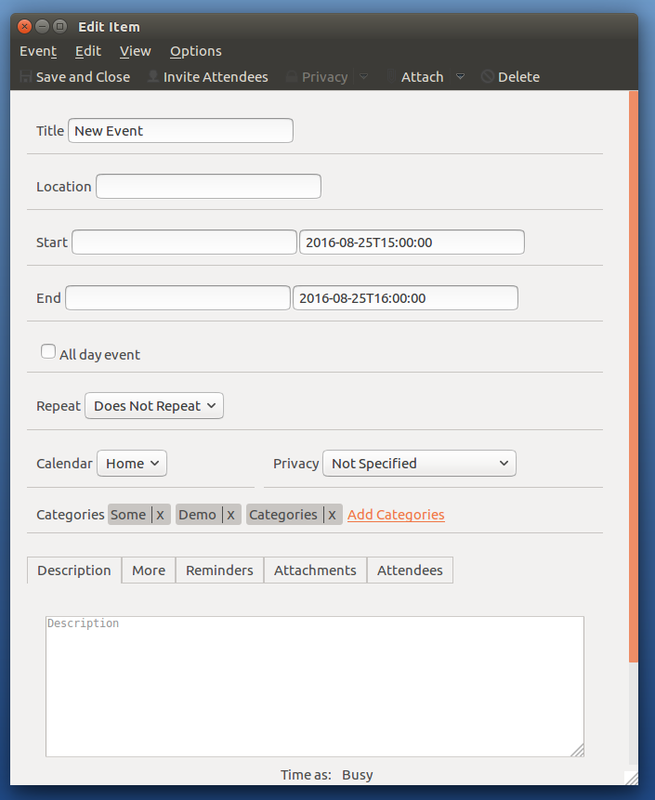 We do however have a great new feature to save copies of invitations to your calendar. This helps in case you don’t care about replying to the invitation but would still like to see it in your calendar. We also have more general improvements in invitation compatibility, performance and stability and some slight visual enhancements. The full list of changes can be found on bugzilla. If you are upgrading manually, you might want to make a backup. Although I don’t anticipate any major issues, you never know. If you have questions, would like support, or have found a bug, feel free to leave a comment here and I’ll get back to you as soon as possible.